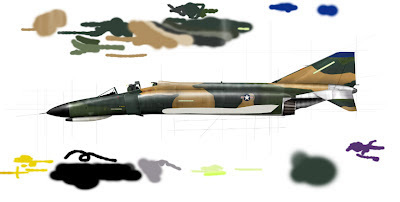 I'm surprised, too as I never really wanted to jump into the Vietnam era on account of this particular airplane; the F-4 was too complex, too big to really look good on paper and too ubiquitous - by avoiding the era, I'd avoid the problem! But, I was certainly wrong. 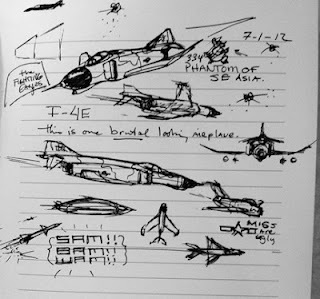 Instead, the Fighting Eagle's Phantom is truly Sierra Hotel, even if I spent almost as much time figuring out the ECM pod as I did the rest of the airplane! A little boy comes home to his mom after a day of school. Mom's waiting and notices - as moms do - that something's not quite right with her son. Puffy eyes, a furrowed brow - all the signs of a kid who's had a terrible day. So, she asks and the tears begin. You can imagine the scene - mom drops to her knee, takes her kid into her arms and asks, "What's wrong, honey?" "Dad's at war!" The boy exclaims. "In Vietnam!" The mom consoles her son with a hug. "Yes. Yes he is. But he'll be ok...."
"But he's dropping bombs on kids like me! My teacher told me!" I really wrestled with this post as two things are weighing in the balance. 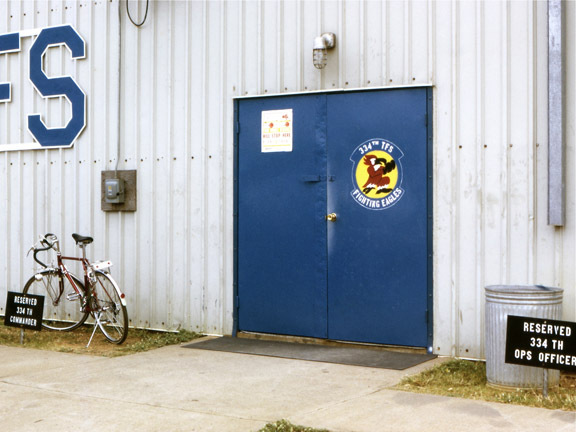 The first is the legacy of the 334th Tactical Fighter Squadron. The second is the legacy of the era. The story above comes from the wife of Colonel Crawford Shockley. He's the pilot mentioned in the artwork. She's the mom who had to love the venom out of the school teacher's bite. Not just for her boy, but for her husband as well. It's a sad story; I've told it to a number of people over the past couple days including a High School teacher and the reaction has been a universal sneer of disgust at the teacher. "How could she do that to a little kid!" This moment became all-the-more important when I asked "Shock" if I could have a look at his Silver Star certificate. He replied "yes" but also used the word, "reluctantly." However, I felt the need to poke a little more and got the most unexpected statement. "Well, we weren't exactly welcomed home, you know." Ah yes. "Vietnam." It's not just about the airplane but the era. Thank gawd times have changed. Think about this. Regardless of our beliefs, I think all of humanity can agree that "Ignorance" has killed and harmed more people than any other force. But Ignorance also has an antidote that is shockingly easy to apply - Knowledge. I think back on those times and wonder how on earth such a prejudice could be applied to people who by obligation (draft or enlistment) answered a civic expectation?! Of course you agree - hindsight is 20:20. But do you care on betting that such a wave of silliness won't taint the waters again? Ha. 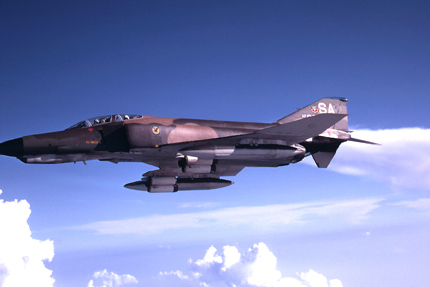 Would you mind having another look at my F-4? Only this time, don't just stop at the glance. And don't just settle on the unsettling demonstration photo. Do your brain a favor and check out a few books on the start of the Vietnam situation. I suggest this one (click here). Knowledge is expensive - it requires time and energy but it's a fine bulwark against the forces of group-think and ignorant emotion. 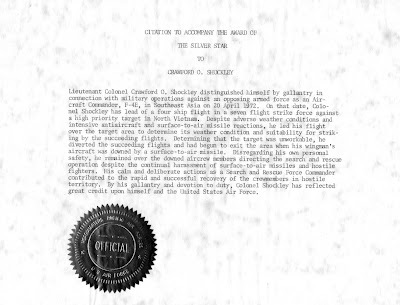 Originally, I planned this post as an honorarium to Col. Shockley for being awarded the Silver Star. The story is rich in personal risk, teamwork (salute to WSO "Poobah") and individual accountability - these are the virtues that create the wealth and security that (most of us) desire. Instead, I dedicate it to Lilly Shockley - mother of boys, wife of a fighter pilot and unfortunately, the Front Line in a culture war. Lilly, I am sooo sorry you had to bear that awful moment. So, let's leave Lilly on a better note - the photo below is Shock's homecoming. It truly is good to be home, isn't it? There's a silver lining to this story in that we live in a nation where dip-stick teachers can spout their swill ad lib. Think about this - what if you - you - were so afraid of your government that you didn't dare breathe otherwise? 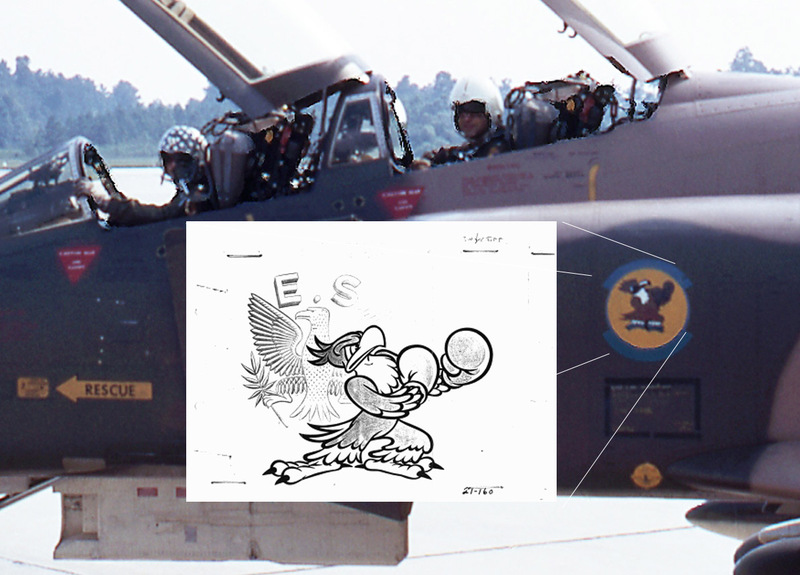 In that spirit, I look at the Fighting Eagles of the 334th and consider this F-4E Phantom to be among my proudest moments. P.S. - Crawford Shockley's Silver Star cert is below. I hope you read it. It's the military recognition of a Dad looking out for "his other boys." P.S.S. - To that teacher of 1972 - wherever you are, I hope you went back to school. To learn. *Shock did get his WSO's (the guy in the back seat) blessing before committing to sticking around the hot zone for the downed airmen. In every conversation I've had with Shock, he's mentioned Larry "Poobah" Henry and remains grateful for his trust and excellent skill. Ok. You can look but don't expect to see much. This thing is a long way from reality. But, it's moving in the right direction. The exhaust area was giving me fits a couple nights ago until I remembered seeing heat distress on a sharp photo of an F-100, then mimicked the effect with a light pass of purple. If you ever see the final piece - even close-up - you won't see the purple. At least that's my hope! I am working to make sure what we perceive is actually seared metal. In art, "perception is reality." I have a William S. Phillips piece hanging in my #2 studio that I use for inspiration. Far away, it looks like a silver B-29. Up close? It's a blue B-29. 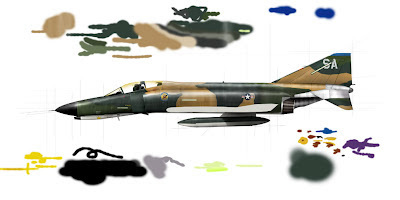 He's definitely one of the best aviation artists ever and true master of the trickery of color. This is a good segue to bring up one of the main tasks of the 334th, laying "Chaff." And for that, we should brush up on the knowledge of Radar. Radar works by sending radio waves out from a device, waiting for the waves to hit an object and then collecting the returning waves at the source. It's actually a 19th Century discovery, but it took until the 1930s for the idea to really manifest itself for military purposes. The Brits used radar rather well to determine where the German bombers were going to attack during the Blitz of 1940-41. From then on, just about every combatant in WW2 used radar in some fashion or another for the obvious reasons of detection. But, every good trick demands an even better counter. One of those counters was a thing called, "Chaff." 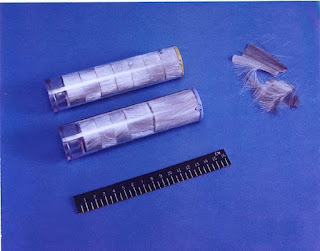 Chaff is a device that, when dispersed in the air, mimics the substance of an aircraft. When the enemy radar detects the Chaff, the signals that come back are essentially gibberish. The results are critical - a jumbled radar scope can nullify radar-guided weapons like guns or missiles and it can also keep the enemy in-the-dark about the actual target. For Chaff to work, a number of factors have to be right. But most importantly, the stuff has to be in the air long enough to mess things up for the radar readers. So, it has to be light enough to "float." Put it up too soon and it goes away. And don't even think about being 'too late' because by then, someone might be dead. I thought you might like to see what the WW2 variety looked like - see below. 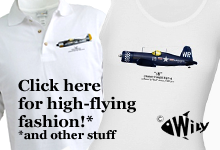 And for extra authenticity, it's held by WW2 fighter pilot, too. Anyway, this is what Chaff looked like back then - metal impregnated paper strips. And when TONS of it were dumped into the air, the little pieces looked like big bombers. Or, at the very least, a massive blob of "unknown." 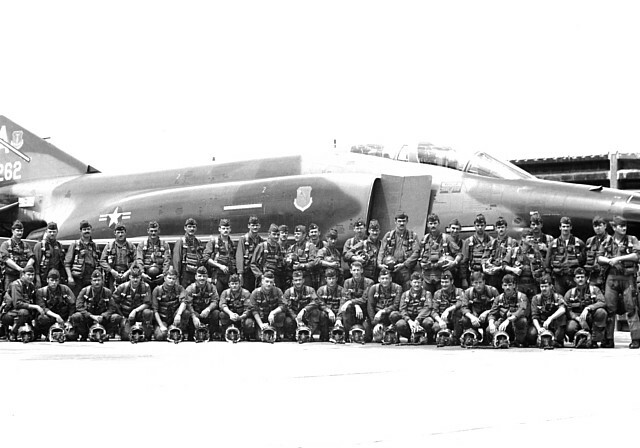 25 years later over Vietnam, Chaff was still an important trick. In fact, it was really important because of the advent of radar-guided missiles called SAMs. Like the airplanes, radar and the requisite counter-measures had evolved. The CO of the 334th, Col. Crawford "Shock" Shockley described, "The chaff we had was almost invisible - almost like hair. You couldn't see it with the eye, but it showed up on (the North Vietnamese) radar. And our job was to be ahead of the rest and lay it down before the rest of the strike arrived." Now think about that for a second. I'll repeat what he said, "...and our job was to be ahead of the rest..."
*click* It became clear. The 334th were the first ones in. Now, being the first on the battlefield can actually be a benefit as the 'element of surprise' is in your favor. But once that's lost - which is instantaneous - the war is on. "(The North Vietnamese military) would see this band of chaff (on their radar screens) and then they'd put all their effort at the head of it because now, they knew where we were!" Don't think for a second that Chaff missions were without high value. In air-combat, time is divided into quantum slices. The quick tick of a clock can contain victory, defeat and an outcome that could be returning home safely, in a body bag or POW camp. The Chaff mission was a hell of a responsibility. And they're also a brilliant illustration of how situations are dependent upon human performance, i.e. competence. To those of us fortunate enough to have avoided mortal combat, the analogy can be brought into our work and personal life easily. 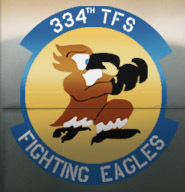 But I can't help but thinking that the 334th TFS learned the crucial lesson of "doing one's work well for the sake of others" better than most. Hmmm. I think I'll look into that. Stay tuned. Especially because the 334th's technical expertise was to be relied upon when they were tasked with using a radical evolution of the iron bomb. In the meantime, the photo below is all I could find of the modern Chaff. Just think - inside that little tube is a whole bomber formation. Or not. 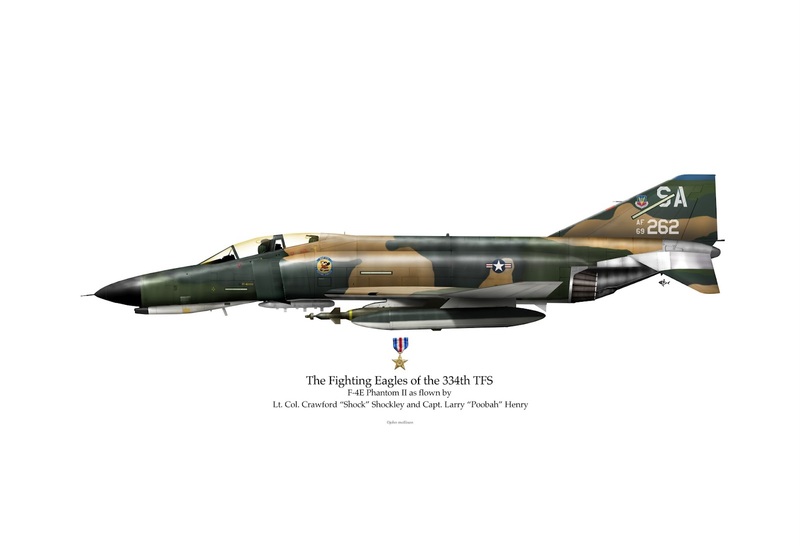 And go ahead and try to find the purple in the F-4. It's there. Really. Note: The 334th were certainly not the only unit in SE Asia tasked with dispensing Chaff over the battlefield. However, they are the only one that earned the nickname, "Chaff Masters." Postscript: More than a few 334th alumni have, after reading this post, expressed their feelings about the Chaff mission. If they can be summed up in one statement, it is this: "I've spent the last 40 years trying to put chaff completely out of my vocabulary and memory." I think I understand why, too. Here it is - my newest project - an F-4E Phantom as flown by the 334th TFS. This sketch - done with a fantastic ballpoint pen swiped from a Hyatt - surprised me with its ease. Some people call the Phantom "ugly." But to me, it's beautiful. Hulking, big and angular, she seems crafted - not by an engineer - but by a sculptor with a wicked vision. There is no mistaking it for anything other than what it is - a war machine. The pressure is always on to do well. But this project brings a new dimension to the work in that it will not represent a specific pilot but an entire squadron. And not just a Squadron but a specific TDY (military jargon for "temporary duty"). In other words, a time and a place and the team itself. 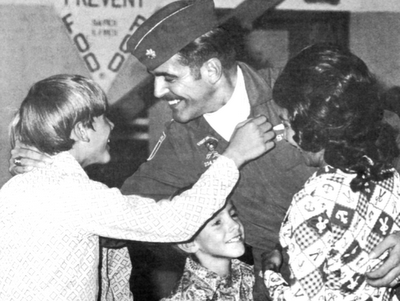 Introducing The Eagles from Ubon, Thailand, 1972. Their 'temporary duty' is no mere corporate rotation but the assembly for an astonishing aerial campaign called "Operation Linebacker." Though many fascinating aspects of the story that will come out later, the one you need to know now is - this is what finally put a stop to The Vietnam War. I'm really amped for this project as I expect to learn much about such a critical time of American history. So much so that last Sunday, while the sermon was on "Walking in the Spirit" I evidently interpreted it as "Flying in the Phantoms" as indicated by the photo (below) of my sermon notes! No offense to my pastor but the way I see it - if God didn't value history, His book would have been a whole lot skinnier. Anyway - time to imagine blue skies, white clouds, green below...and a red-hot enemy. We're going North!